Hi everyone. Thank you for stopping by and thank you so much to those of you who have left such lovely comments. I really appreciate them, especially when they are about projects/pieces that are so important to me. And on that note, here we go with another one! 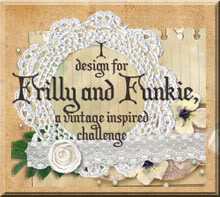 It's an 'Anything Goes' challenge at Frilly and Funkie, and the Design Team have come up with an amazing array of varied projects to inspire you. This cover needed to be resilient as it is intended that this book will be carried around and used for some time to come. Embossing, using stencils and texture paste worked perfectly. No flowers or frills were required but filigree metal pieces added the perfect finishing touches. The central panel took a little while to perfect - masking/stamping, wrinkle free distress and painting with Distress Stains, followed by a final coat of clear embossing enamel. The bottles were a little risky. Having been stamped on acetate, I used a mix of alcohol inks to create the main colour. Small sections were then carefully removed using a fine paintbrush and blending solution - tricky! Finally I mixed some white and black alcohol ink together and painted it into the now blank sections, taking care not to disturb what was already there. A coat of Glossy Accents added that oh so necessary touch of shine and dimension. Having now used this set for its original intention the plan is to see if it can be reworked to suit other themes and situations. Anyone know a mathematician?! And just to show you the inside covers got the makeover treatment too using a second set of new chemistry stamps and an embossing folder (with a diffuser). I do hope you'll join us at Frilly and Funkie to see the other fantastic projects and hopefully enter something yourselves (if you haven't already done so). And if you'd like to know how I created the textured background please join me at Frilly and Funkie this Saturday, 14th September, for a step by step tutorial (including some of my observations on using Distress Paints efffectively). It's no good - I really NEED the chemist stamp now!! Seriously this is a fabulous project which I'm sure your son will enjoy using for his drawings and notes. I LOVE how you used the awesome Laboratorie stamps (had to have them too ;). And I love the stencilled background even more! Wow what a wonderful book! Love it all! Hi Jenny! You've only been and gone and done it again! fantastic project - I love it - a perfect blokey project and I bet your son is thrilled. Really like the way you've used multi stencils and texture paste it really adds extra interest - hope you don't mind if I borrow that idea at some point? Wow. I actually feel like I've just read a chemistry paper! Haha. It all sounds so complicated, but the result is superb. Three times wow, such a fabulous altered note book. Great details. When you take that item and alter the cover as you have done, you take it to a very special place. Fabulous background Jenny and I love those stamps x a gorgeous gift for your son. 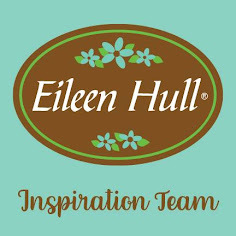 Fabulous book - the texture past embossing is just amazing and those stamps are just perfect. A fantastic altered project and I am looking forward to the tutorial! Love the masculine style with the textures and fabulous chemist image. I bet this book gets well used. I love the way you have used the chemist stamp! The textures and colours are perfect, as with your last post. 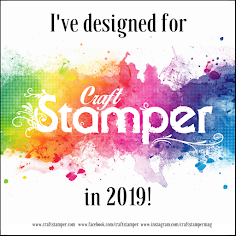 I have just bought this stamp so thank you so much for the terrific inspiration, fabulous project! Completely brilliant, Jenny... I love the textured letters, numbers and bricks giving such dimension and rugged interest. And the paint and ink effects highlighting the depth of the texture are so cool. Tinting on the images - pure perfection, and the inside pages are fab too. A big WOW from me! Wow Jenny...this looks absolutely amazing!!! A nice touch with the alcohol inks too. I do know some mathematicians! (I work at a secondary school lol). Love, love, love the colours that you have chosen. Grand cover! Love the embossed bricks with the chemist! Fabulous! Yet another stunning project, your son will treasure this. Do you think he will use it or just admire your beautiful work. I love everything you have done on this, the colours are amazing. Gorgeous cover Jenny...the bricks, the colours, the great stamps...stunning result! Jenny, this is fantastic. No wonder you are so pleased with it. Love it, love it, love it. Another fabulous journal! The bottles must've been tricky indeed and the outcome is fantastic. I also adore all the stenciled texture... right up my alley!